ASRock reveals the Fatal1ty Z68 Professional Gen3, the first motherboard to support the PCI Express 3.0 standard. The mainboard uses the PLX PEX8608 bridge chip to deliver two PCIe 3.0 x16 slots, and it also comes with four USB 3.0 ports and a number of SATA 6Gbps ports. PCI Express 3.0 season is coming. The new PCIe 3.0 configuration offers more bandwidth to enable faster communication between components inside a system. The world of gaming moves fast. Can your motherboard offer a viable way to play the heavy-loading games? Designed for gamers and advanced users, the Fatal1ty Z68 Professional Gen3 brings the best package for smooth gameplay. It is the world’s first motherboard that supports PCIe 3.0 and goes on sale now. Plus, it comes with plenty of options for gaming excitements and upgrading components. 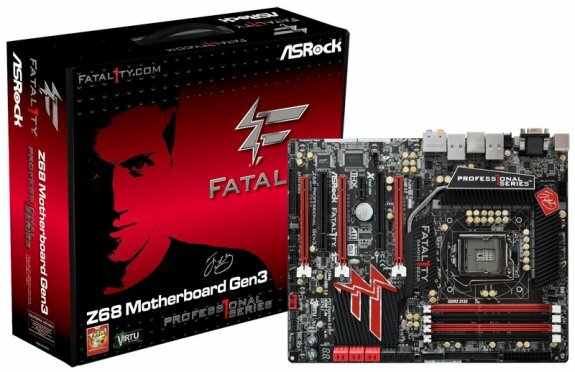 “ASRock-Fatal1ty Co-Brand motherboards represent the quality. The vision of Fatal1ty board is to create the fastest and most stable computer equipment on the face of the planet.” commented James Lee, V.P of ASRock Sales and Marketing. Keep this in mind; ASRock is keen on delivering the most powerful motherboard products to satisfy the serious gamers. “Not only focusing on performance boosts, the newly launched Fatal1ty Z68 Professional Gen3 also pays special emphasis on the latest hardware enhancements that include the newest PCIe 3.0 support” said James Lee. Gaming is a way of life. A high-spec system is a must for playing the latest games. For unbelievably powerful gaming without being tied to a desktop, the serious gamers should look no further than the Fatal1ty Z68 Professional Gen3: the world’s most powerful Z68 motherboard. Functionability is incredibly important for computing, so you’ll need to ensure you have the right motherboard. Supporting the Intel Smart Response technology, this board can make the SSD become the "Cache of the HDD" to boost up the HDD access speed. In addition, the ultimate Lucid Virtu Switchable Graphics technology allows dynamic switching between the GPU of the Sandy Bridge processors and a discrete graphics card, without the need for a system reboot. The Fatal1ty Z68 Professional Gen3 comes with some VGA outputs, D-Sub, HDMI, DVI-D (supported by the bundled HDMI to DVI adapter), 7.1-channel audio with THX TruStudio™ and integrated Dual Gigabit LAN with Teaming function. To build up your unique gaming masterpiece, the Fatal1ty Z68 Professional Gen3 motherboard will surely serve all gamers’ needs very well. When Intel released its Sandy Bridge processors in January, they were met with general applause and excitement. ASRock’s Fatal1ty Z68 Professional Gen3 mainboard is the first to meet the latest PCIe 3.0 standard and go on sale based on Z68 chipset. To be the very first to enjoy the advance function of PCIe 3.0, you should never miss out the Fatal1ty Z68 Professional Gen3!